Here’s a pretty shocking statistic: by age 17, about 7% of Americans have lost at least one tooth because of decay. In the 35-44 age group, 69% of us have lost at least one tooth to decay, accident, or disease. We’re a lot better at keeping our teeth than our great-grandparents’ generation was, but the data tell us that most of us will have to deal with losing a permanent tooth at some point in our lives. We can minimize the risk with good dental hygiene, regular checkups, and reasonable precautions against injury, but life still happens. A missing tooth is not a pretty sight, but the downside doesn't end with a wounded smile. The resulting cascade of issues begins almost immediately after tooth loss and can snowball into severe consequences, including losing more teeth. When a tooth goes missing, its neighbors on both sides begin to move, as if trying to fill the gap. The shifting is slow, but sure, and gradually opens up new gaps where food can get stuck and nourish decay-causing bacteria. Dental hygiene becomes more difficult, decay becomes more probable. That’s not all. A missing upper tooth spells trouble for its opposite lower tooth, and vice versa. The tooth opposite a gap is not only fairly useless for chewing, but also is at risk of overeruption due to the lack of counter-pressure from its now-missing opposite number. Overeruption ( or supereruption) over time can expose the tooth’s root and loosen it. It may become the next one to go, starting another chain of problems. For one thing, a missing tooth shifts the chewing load it used to bear to the other teeth, increasing wear and tear on them. Finally, loss of a tooth can lead to bone loss in the jaw, even to the extent of visibly altering the shape of a person's face. Something must be done. Dental bridges have been the traditional solution for many years. A bridge, in the simplest case of one missing tooth, has an artificial tooth resting on the gum, in the gap, and secured there by the two adjacent natural teeth. The artificial tooth, called a pontic, serves to keep its adjacent neighbors from shifting and provides a point of contact for its counterpart in the opposite jaw. The procedure for a bridge requires at least two office visits. During the first visit, the teeth on either side of the gap, called abutment teeth, are prepared for their new roles supporting the pontic. The bridge consists of crowns placed on the abutment teeth and anchored to the pontic between them, so the first step is the removal of enamel from the abutments to accommodate the crowns. 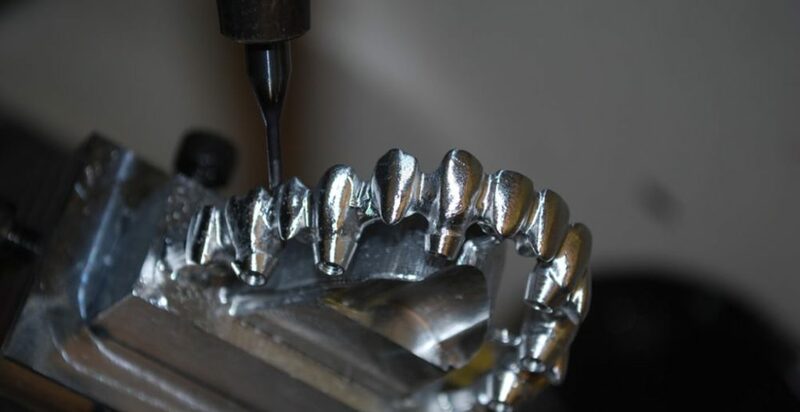 The dentist next takes impressions of the abutment teeth, which are sent to the lab for custom fabrication of the bridge, crowns and the pontic. A temporary bridge is put in place while waiting for the lab to finish its work, generally a week or two. The second appointment sees the temporary bridge removed and the custom-made permanent bridge installed. A great deal of care is taken to make sure the fit is perfect, which may require one or more additional visits with adjustments. Temporary cement is generally used until the dentist is satisfied that fit and bite are perfected, at which point the final installation is completed. Pontics are made of porcelain fused on to metal alloys, or of ceramic. They look, feel, and function like natural teeth. There are variations on the procedure and hardware described here which are adapted to situations in which a missing tooth has only one next-door neighbor, when more than one tooth is missing, or when more than one abutment tooth is needed to support an end of the bridge. A dental bridge's useful lifetime is in the range of 7-15 years, with 10 years as a reasonable expectation. When a bridge comes to the end of its useful life, it needs to be replaced. The reshaping of the abutment teeth is permanent and irreversible, so in any case, they've got to be kept crowned. Good hygiene habits and regular checkups go a long way toward extending a bridge's term of service. There are a few respects in which a dental bridge falls a bit short in solving the problem of a missing tooth. The need to grind away what may well be perfectly healthy material from the abutment teeth is one. These teeth are then sometimes more vulnerable to decay, calling for extra diligence in cleaning them. The pontic, while cosmetically and functionally like a natural tooth, doesn’t replace the root of the missing tooth. The absence of a root accelerates degeneration of bone tissue in the jaw, and some loss of gum tissue is not uncommon. This brings us to consideration of the alternative solution to missing teeth, which is implants. This approach offers several advantages over bridges. Implants are longer-lived. For patients over 40 years old, they are generally for life and never require replacement. Implants rest on artificial metal roots sunk into the jawbone, which mitigates the bone and gum loss issues raised by "rootless" bridges. The implant tooth itself is invulnerable to decay, and also doesn't require modification of adjacent teeth, so there's no added risk of decay there either. These advantages don’t come without costs, financial and otherwise. Implants are considerably more expensive than bridges, and in general are less likely to be covered by insurance. The low-end cost of an implant is higher than the high-end of the bridge cost range and can reach $10,000 in more than a few cases. Unlike bridge installation, implants require what is expressly a surgical procedure. It's in the nature of things that more complex procedures are more subject to complications. Bone grafts may be necessary, notably when the tooth has been missing for a long time. Additional CT imagery may be needed. In fact, some patients are not candidates for implants at all due to insufficient jaw bone density. Finally, the procedure takes longer, start to finish, than does a bridge. Bridges are a reliable and relatively economical treatment option for missing teeth. They’ve been a standard, widespread dental practice for a very long time, and so are unlikely to run into complications. Getting a bridge involves less investment of a patient’s time and money, and yields outcomes which are very satisfactory in most respects. It’s inarguable that implants are superior in certain ways, and if these advantages are important to an individual, and the higher costs are not an obstacle, that person should certainly seek evaluation of his or her suitability for that procedure, and also have discussions with the dentist that provide a thorough understanding of what to expect. Another approach to this choice, when the expense is not the deciding factor, is to choose the most conservative solution that gets the job done. It's less complicated than it may seem here, and for most people will be quickly simplified by a dental exam and evaluation.